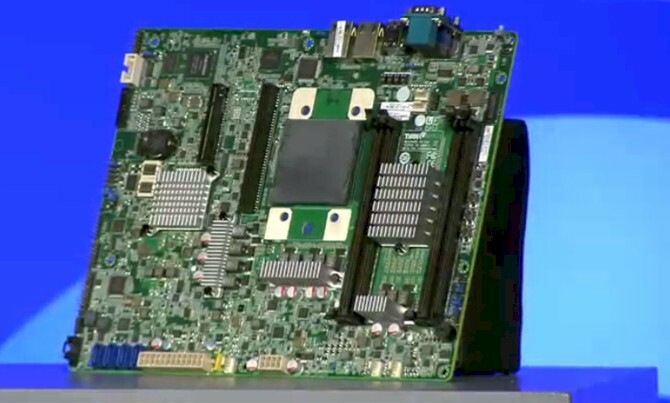 EnterpriseTech told you a few months ago that Google was working on its own server motherboards based on IBM’s Power8 processor and at the Impact2014 conference in Las Vegas that Big Blue is hosting this week in Las Vegas, the search engine giant showed off its own homegrown system board. And we have also gotten some insight into the Power8 system board that Tyan put on display last week. At a separate event last week called the OpenPower Innovation Summit, Gordon MacKean, engineering director for the platforms group at Google and chairman of the OpenPower Foundation that is opening up IBM’s Power8 hardware and software for licensing, showed off a single-socket, ATX-style system board created by motherboard maker Tyan as a software development reference design. Chuck Bartlett, worldwide technical support director for Tyan, said last week that its Power8 motherboard will be sold to software developers so they can test their code and that it will also be made available to whitebox server makers, hyperscale datacenter operators who design their own systems, and to IBM for future systems. IBM and Tyan have agreed to donate the specifications of the reference system to the OpenPower Foundation, which means that members will have access to the specs so they can make customizations of their own. The Tyan reference board is called the SP010 and a spokesperson for Tyan says that this is a tentative name for the board and adds that it is aimed at small and medium businesses, virtualization, and data analytics. The SP010 has one single-chip module (SCM) variant of the Power8 processor, which, by the way, we learned is code-named “Turismo.” The Tyan board has four DDR3 memory slots, four 6 Gb/sec SATA peripheral connectors, two USB 3.0 ports, two Gigabit Ethernet network interfaces, and keyboard and video. The ATX board measures 12 inches by 9.6 inches, which means it can easily fit in a standard rack or tower server. The board is interesting for a number of reasons. First, it has two Power8 sockets instead of one, but don’t jump to conclusions and assume that it is using NUMA clustering across those two nodes. The system shows the Foxconn logo on the processor sockets so presumably Foxconn is making the board. The second interesting thing you will notice from this board is that it does not have standard DDR3 memory sockets. There are five dark gray slots and four white slots that look mechanically like PCI-Express slots, and they could indeed be just that. It is possible that DDR3 memory slots are on the other side of this Google motherboard, which I would expect to have at least four memory slots per socket and maybe more. Some of the connectors shown could be for external memory cards using the “Centaur” memory buffer chips. But this does not look like the right kind of connector for this. Some of these PCI-Express ports could be used to power up the system board, as is done with microserver designs these days. If you look closely, the board seems to have four modified SATA ports, which are much wider than the normal SATA ports. We have calls out to Google to get some clarification on the feeds and speeds of this system board. We will bootnote if we get any more clarification. Bootnote: A source at Google had only this to say about the Power8 system board: "The board shown yesterday is intended for Google use, and we are not bound by industry standard uses of connectors. We do not have any additional details to share on the specific functions of the connectors." The “modified sata” ports look like SAS ports. Those sata ports look like they match an ssd drive, so probably on board standard/ enterprise ssd/mlc sitting vertically up on board, no cabling. Hadoop node?